Heat oven to 350°F. Remove dough from can. Cut crosswise into 8 pieces. Place pieces, cut side down, on ungreased cookie sheet. Bake 16 to 18 minutes or until golden brown. Cool 10 minutes. Meanwhile, cut each chicken breast in half horizontally. Cut each half crosswise into 2 pieces, making 8 total pieces of chicken. Brush each piece of chicken with butter; sprinkle with seasoned salt. Heat grill pan or grill over medium heat. Place chicken on grill. Cook 2 to 3 minutes; turn. Cook 2 to 3 minutes on other side or until juice of chicken is clear when center of thickest part is cut (at least 165°F). Top each chicken piece with 1/2 slice cheese and 1 slice bacon, broken into 2 pieces. Cut each roll in half horizontally. Place lettuce on rolls; top with chicken. Serve immediately. Make the slider buns up to a day in advance. Store cooled slider buns in resealable food-storage plastic bag or on a platter covered with plastic wrap. 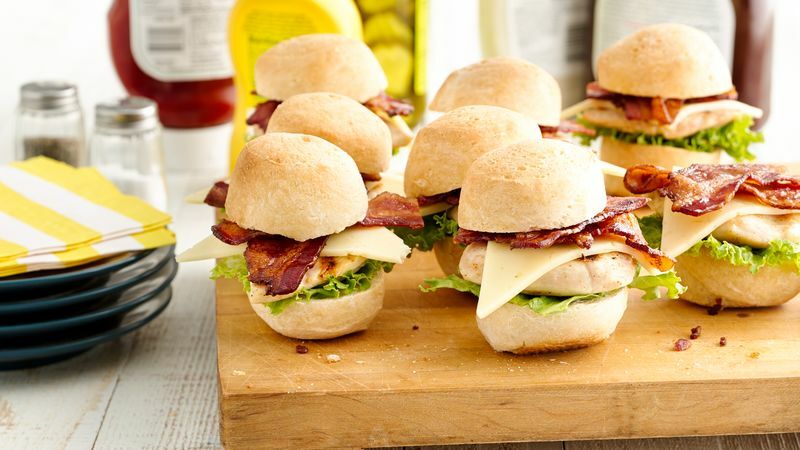 Serve sliders with ranch or barbecue sauce for dipping.